I love building, but love making things legit even more. I made a 150x150 floating island with a 12 high, 3 thick log wall. However, I never finished the bottom of it I also made other floating islands, a massive stone colosseum that took 50 stacks of stone, a giant museum, and some others. Sorry if this sounds ignorant but how do you build a floating island legit? People usually ask It starts with building a "noob tower" up, then a floating platform. Then you round it off and whatever, then just go back down on the noob tower and round the bottom out. When you're done, remove the tower. The easiest way to get up is usually a waterfall. I am 50% of completing a tunnel. I might upload pics. I have now 42 slime balls! Awesome! I just made a floating city, but it wasn't legit. That's how I made my city! Just made a cool looking shop! I can't really respond to this as we don't share views on what legit means. shouldn't it melt into a pile of water because its head gives off heat? Millienaire might be easy for some people to install but since I never install mods, that was a tough one to get, sadly there was an update the next couple of days I got it and I never got it again. Awesome! I made one too! This picture shows the central main staircase which forms the center of the structure. I have finished 3 of the 4 primary trunk supports. I am currently clearing out the jungle area where the 4th primary trunk support will go in the back. Between those 4 will be 8 smaller auxiliary support trunks that will also help form the main central platform where I will build all of the structures (at Y level 90). Outside of all of these will be the myriad of outer 'roots' that will end up rising out to form the outer skin of the tree itself. I haven't yet decided how many main or auxiliary branches I will put on it but the 'tree trunk' itself will be around 1M blocks by itself. I couldn't really have built anything this large until the game made the vertical axis taller. The tree that was here before had a base that was 64 (roughly 8x8 in a circle pattern) blocks per level and was almost 80 blocks tall. I tore that down after they boosted the Y axis limit so I could start working on my larger treehouse project. I will add additional pictures once I get farther along. 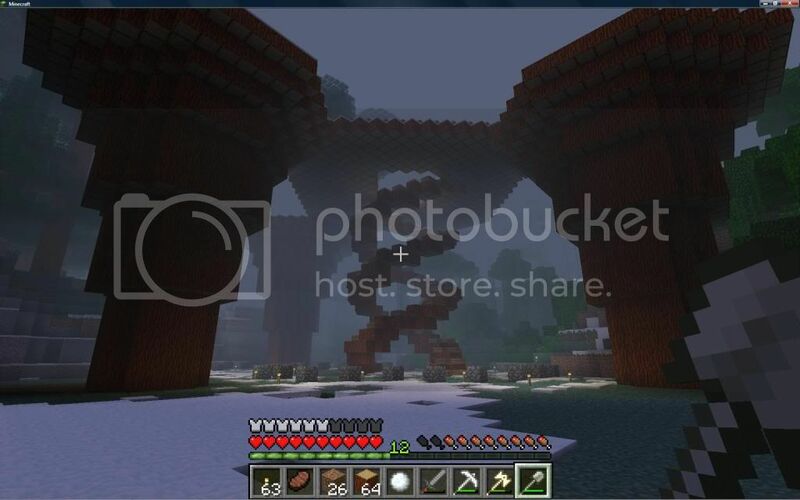 The coolest thing that I made 100% legit on the multiplayer server that I played on (until my step-son got bogged down with college ... he hosts the server) was a 3 dimensional labrynth that measured 125 blocks long, 80 blocks wide, and 25 blocks high that I built starting on level 10 with the floor. It had 4 floors that you had to navigate through in order to find the exit. I specifically made the laybrnth to resist the standard puzzle solving techniques such as follow 1 wall until you reach the exit. Since you have to transverse multiple floors, and some staircases go from floors 1 through 4 some only go between 2 floors and others go between 3. Some stairs end up in a dead end. That was just the prototype as I wanted to get all of the staircases oriented the correct direction before I made the one I actually wanted to build. The final one I am going to make out of obsidian and light it with netherrack and lava floes. In order to make the obsidian ... I will need to make a crapload of trips to this massive lava I have in my game and form it like pouring concrete. But in order to do that I need the prototype so I can get a negative mold to make out of cobblestone in order for my to pour the walls. The labrynth takes up approximately 250k blocks of space. After I am done with my treehouse I will begin work on my labrynth and probably make a video of it and link it here as an update. I will also post pictures of it in progress similar to what I am doing with my treehouse. *Note* I am a puzzle fanatic. The harder the better Imho. I absolutely love really difficult soduku puzzles. In order to create the prototype, it took me about 3 months of pencil and paper drawing to make the design for the labrynth at the diffifulty that I wanted. Neither my son, my step-son, or their 3 friends that played on our multiplayer server ever admitted to getting through it even though they made multiple attempts. Most starved and died because they couldnt find their way out once they went in. I tried to get through it without my notes and it took me just over 4 days of working on it (and I designed the thing). When they do this singleplayer / multiplayer thing I will be interested in seeing if anyone else can make it through. After the first person died in my prototype labrnyth I added a chest to the entrance filled with bread. 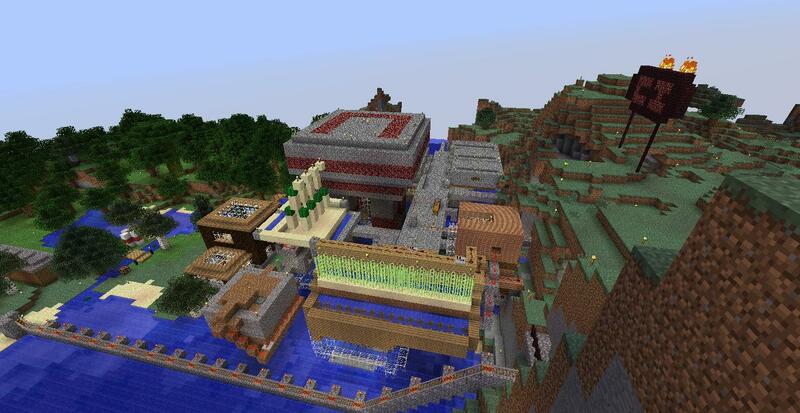 Build on an SMP Server. There are some plugins active, but non provide any out of the way advantages. Woah that looks awesome and the description is detailed!